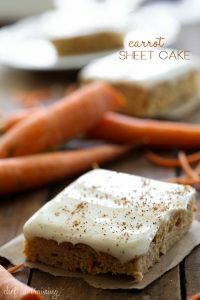 This Carrot Sheet Cake is amazing! It is super moist, full of flavor and the cream cheese frosting is perfection. This cake is DELICIOUS! It is so moist and perfect for fall! Cream butter and sugar together. Beat in eggs and sour cream. Add carrots and vanilla. Add flour, cinnamon, baking powder, and salt and mix until well combined. Pour into a sprayed 13x18 inch cookie sheet. Bake 30 to 35 minutes at 350 degrees F. Cake should spring back to the touch. Cream together cream cheese and butter. Beat in powdered sugar, vanilla and milk. Spread over cooled cake. I like to sprinkle a little nutmeg over the top for garnish. Carrot cake is one of my favorite things on EARTH! And so is cream cheese frosting! I love that there's almost as much frosting as cake on yours...I would hog this and devour it! Pinned! Nice and simple! I love the short list of ingredients. All the better to showcase the amazing frosting! Wow, these look delicious. I'm not a huge carrot cake fan - but I'd jump on board with these! I absolutely love carrot cake and this carrot sheet cake is great -- I can bake it more often. a great recipe for one of my favorite cakes! delicious! This is a "must-try" recipe. Made it with my daughter today and it was delicious. I will add this to the holiday table!